Science communication, science education, and the stories we tell about science. This blog hasn't been very active the past few months. The biggest reason for this is that my attention and time have moved to a new site: cartoonphysics.net. 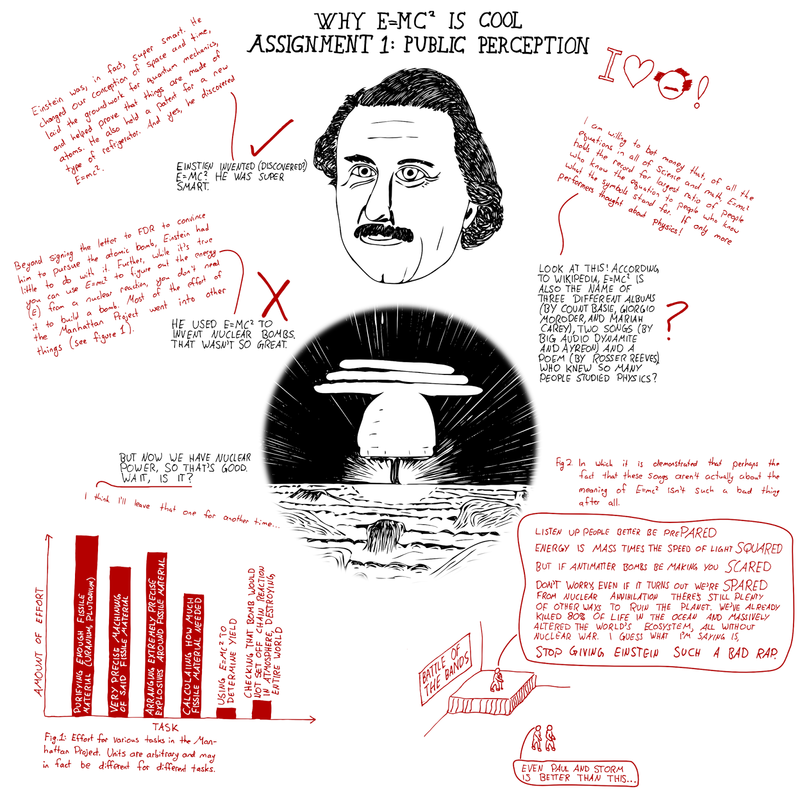 Like this blog, the new site focusses on science communication. Unlike this blog, the new site involves explaining science (rather than discussing how people discuss science) and also drawing. I'm really excited about it. Sadly, this means that this blog is, as of today, retired. Cartoon Physics and twitter will meet my need to express myself on the internet. So goodbye, Writing Science, Fiction; it was nice to know you. So it's been a while. And not, as you might suspect, because I've been lazy. Rather my science communication time (which is given by Total Time MINUS time doing enough work to keep my research supervisor happy MINUS time ensuring that the students of Physics 101 [yes, it's actually called that here] get tutorials and marks and such MINUS time spent ensuring that food and clothing and basic cleanliness happens MINUS just enough time with my family to keep my sanity MINUS perhaps six hours of sleep a night) has been taken up by a couple of other projects. Project 1: More Drawing! 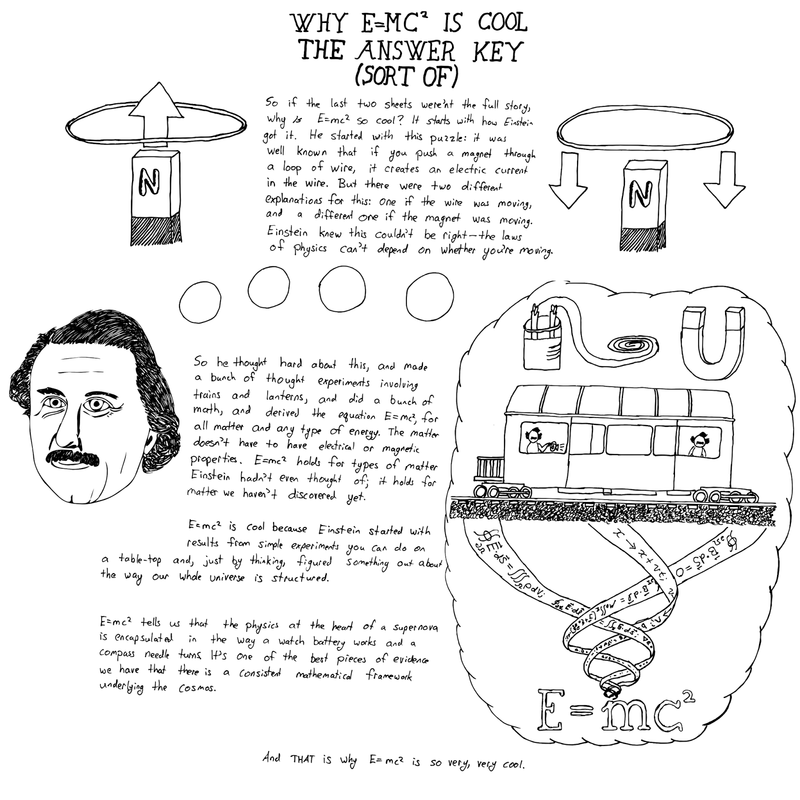 I illustrated a series of pages looking at Einstein and E=mc^2. The content is similar to what I wrote here, but modified for visual appeal. These drawings actually got their own physical copies which hung out in the Irving K Barber Learning Centre here at the University of British Columbia, as part of a science-art exhibit called "Inescapable Perspective" put on by the UBC Carl Sagan Association. Project 2: A Video! I've been teaching myself how to do 3D animations in Blender, and the result is this video, which shows how our sense of smell works at the molecular level, using scenes from Star Wars. I made this for the Faraday Show, an all-ages science show (in accordance with popular usage, all-ages=kids) put on by the UBC Dept. of Physics & Astronomy (there were also some chemists involved). The name comes from Michael Faraday, a British physicist who did a bunch of important work way back in the day, and also put on a physics show for kids every Christmas. These two projects have been sucking the life out of this blog, but hopefully now I'll have a little more time (ha!) to catch up on some topics I've been dying to write about. 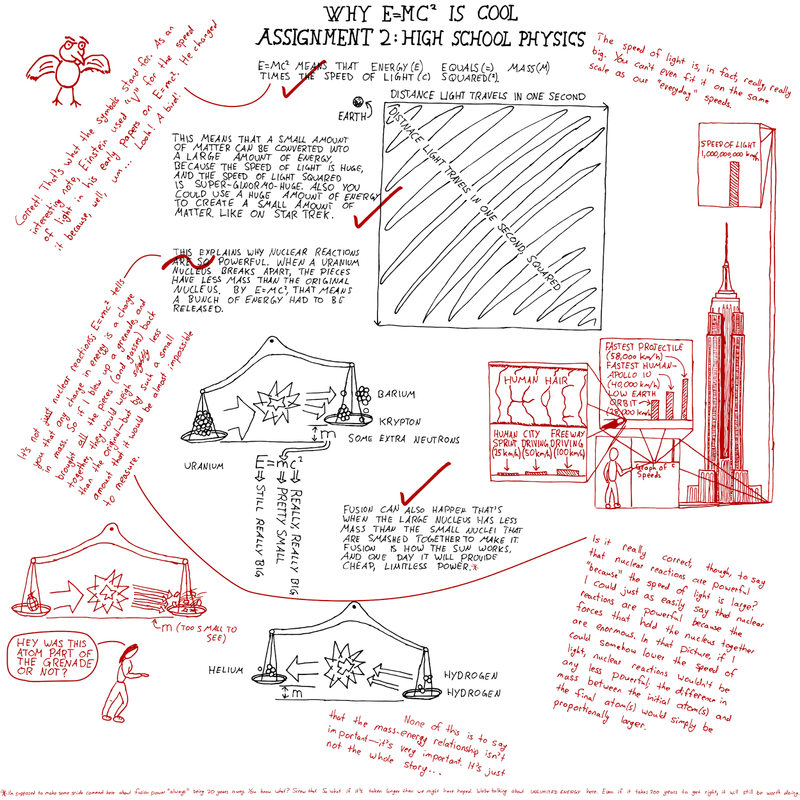 A while back I started a feature called my Scientific Notebook, in which I put up sketches I did that explained science. It didn't really fit with the tone of the rest of the blog, but I did want to post them somewhere. Well, the people over at the UBC Carl Sagan Association, whose mission is to communicate science, have agreed to post some of my sketches on their blog! So future Scientific Notebook entries will likely wind up over there. The first one is already up. If you read this blog you'll recognize it as covering some of the same ground as this post on genetics, though it approaches the topic differently and has more pictures. Wouldn't it be cool to have super-powers? That's the premise for a huge number of TV shows, movies, books, and of course comics. Apparently wondering what it would be like to be able to fly, read minds, teleport, or stop time is a pretty universal past-time. And as every fan of superhero stories knows, one of the most important elements is the origin story--how the hero gets their powers. They could be from an alien planet, or be vested with an alien artifact. They could be an ordinary person with access to specialized technology. Radiation could be involved. Or it could be that humanity is evolving to its next state, and that state involves super-powers. This last one is among the most popular. It's the basis for X-men, one of the biggest superhero franchises out there, as well as the TV show Heroes, and numerous other series. And it's the basis for the new TV series (which is a re-boot of the old TV series) The Tomorrow People. I've watched the first couple of episodes of The Tomorrow People, and I liked it. I'm hopeful that, by focussing on just three powers, the show will be able to look at their implications with a little more depth than normal and avoid painting themselves into a corner (as in, "wait, doesn't Peter Patrelli have, like, every power? Why are there any world-threatening problems he can't solve?"). I also like the whole double-agent angle, and I hope the show has the courage to explore some murky waters and moral ambiguity around whether those with super-powers should be policed, and if so, how. But what I want to talk about now is the science. Yes, I'm sure you can already predict where this is going. "Evolution doesn't work like that, there would be many harmful mutations for every beneficial one, evolution can't 'look ahead', how could a single gene cause people to teleport..." Well, I'm not going to complain about those (mostly). I'm willing to cut a TV show some slack in its superhero origin stories; it's primarily entertainment after all. If I wasn't willing to suspend disbelief I wouldn't enjoy much media. I do want to point out two things, though. First, the leader of the bad-guys is supposed to be an expert genetics researcher. At one point, when threatened by one of the super-mutants, he discusses how the tomorrow people can't kill anyone--they freeze up if they ever try to. Bad-guy-leader talks about how this will eventually be a beneficial mutation, but sadly right now it's a liability. This is exactly the kind of mutation that can't evolve. Evolution has no "look-ahead"; genes proliferate because they're beneficial right now, not many generations from now. Having the scientist character basically rub the audience's face in bad science took me out of my suspension of disbelief for a moment. It's always better to leave some things unsaid and let viewer's imaginations fill in the details than to over-explain and blunder. The more important issue is the show repeatedly referring to "the gene" that causes these superpowers. It also refers to the tomorrow people as being a new species, not entirely human--it's something they stress on multiple occasions in the first two episodes. The clear implication here is that a change in one gene can move you from "human" to "not-quite-human". And this, to me, is a problem. In any species there is a fair bit of genetic variation--humans are no exception. You have different genes from the person standing next to you (unless you're standing next to your identical twin). A large part of that variation comes from sexual mixing--because you get half your genes from each parent (and because there's a lot of genes to pick each half from) you end up with a unique mix of genes. None of this variation makes any of us not human; it just means we're all unique. Humans simply aren't a mono-culture. Why am I picking on this particular point? Because in our non-fictional world, people have used a small locus of genes to argue that certain other people weren't fully human. Genes like the ones controlling skin pigmentation, or hair texture, or even nose width. We have a long, sad history of classify some people as subhuman, and even today there's still some hold-outs to that view. This may be part of the point in some superhero stories. Certainly in a number of the X-men stories the parallels between the mutants and oppressed minorities in the real world were intentional. I worry, though, that the emphasis The Tomorrow People puts on a single gene leading to a new species will lead audiences to internalize the message, "different genes always mean different (sub)species". This would be a disservice, regardless of what else the story might say about tolerance. It would be nice to hear, just once, in a story about mutants with super-powers, someone point out that mutations aren't rare, and that genetic variation doesn't make some people not human. Can we work on that, TV writers? It's time to award the prize for best headline about the awarded of the prize for best physics by the Nobel committee. And by "best", I mean in the can't-look-away-from-the-train-wreck sense. Background: as you may have heard, the Nobel Prize for Physics was announced, and surprising no one, it honoured the discovery of the Higgs boson (just the theorists though--no love for the experimentalists who, you know, actually found the thing). "Brit boson boffin Higgs bags Nobel with eponymous deiton"
Scratch that, I'll begin with the words. "Boffin" seems to be some sort of British word for expert. That's fine, but the headline implies that Higgs is an expert on "bosons". Bosons, for those who don't know, are one class of particles; the other class is Fermions. Every single particle or collection of particles (which includes, well, everything) can be classed as either a boson or a fermion. Higgs isn't really a boson specialist, though--the category is so wide it's hard to know what that would even mean. Rather he used quantum field theory to predict a new particle, which happened to be a boson. "Deiton" appears to be a new word coined by the good people at the Register. No explanation is given but it would seem to refer to the fact that the Higgs boson has sometimes been called the "God particle". "Eponymous" seems like a strange choice for a context in which clarity is presumably important, especially when paired with the made-up "deiton". Beyond the actual words, though, there's a bigger issue here, and it's conceptual. The issue is whether a headline exists to inform, to set context, and to draw in interested viewers; or to show off the cleverness of the headline writer. It seems like the Register opts for the latter. Please be aware that a truly clever headline is one that sets up the reader for what is to come in an accurate, concise, and clear way. Also, as a rule of thumb, headlines should probably not contain words you just made up. Just saying. So the Nobel Prize in Physiology or Medicine was awarded today to three scientists for their work on how vesicles move various molecules and substances around cells. The science here is very cool. I will note, without taking anything away from the work done by the recipients, that the prize went to three white men; two born in the US, one is Western Europe. Since its inception more than a hundred years ago, ten women have one the Nobel Prize in Physiology or Medicine (out of 204 winners), four women have won the Nobel Prize in Chemistry (out of 162 winners), and two women have won the Nobel Prize in Physics (out of 193 winners). No Nobel Prize in the sciences has ever been awarded to a black man or woman. We still have a long way to go. If it wasn't enough that industrial fishing has killed off 80% of the biomass of the oceans, the effects of warming and CO2 absorption (which changes the ocean's acidity) are causing the world's largest ecosystem to decline faster than previously thought. This is a great post on Malcolm Gladwell and the danger of oversimplifying science--a perennial concern here. Hopefully I'll find a little more time for writing this week. Well, maybe next week. Okay, it's going to be a while. Last week protesters gathered in a number of Canadian cities to draw attention to the science policies of the current government. Their concerns are, according to the press, that the government is keeping scientists from communicating to the public, and also that it's defunding important scientific projects. Here's my problem with this: the media reports are making two things on very different scales of problematic seem equivalent. First, the money issue. If you read the second article linked to above, it's the main reason for the protests. Scientists aren't happy with the funding for science under the Harper government, particularly with regard to basic research. This is a legitimate complaint for scientists to make; they want to see Canada reap the benefits that come from having a strong research community and they see these cuts as threatening that. We do live in a democracy, though, and the people of this country elected the Conservatives on a platform to cut government spending. So while it makes sense to argue that the cuts are ultimately going to hurt the country (an argument I am on board with, as it turns out), it's also important to realize that in this regard the government is, in fact, doing what they said they would do during the election campaign. The muzzling issue (which is the main reason for the protests according to the first article linked to above) is an order of magnitude more serious. This isn't about saving government money. Public money was spent on research, then once the results were in the government demanded that they and they alone see the them, before deciding what to pass on to the public after suitable editing. Selectively releasing results is a form of dishonesty; it's no different than when pharmaceutical companies release studies that show their products in a good light and bury ones that point to potential risks. When certain research outcomes are suppressed the government is, as a whole, giving the public a misleading picture. This is an issue that should transcend political affiliation. Whether you believe in big government or small, decision makers need the clearest picture they can get from the people the public is paying to investigate some of the most pressing issues facing the country. It's no secret that the Conservative government and the science community have been at odds. By both occupation and political leaning I am on the side of the science community, but this is a bigger issue than just some professional researchers wanting job security. Ultimately the question is this: Is the government is interested in getting the best answer to the questions that matter to policy, whether or not those answers line up with political ideology? The alternative is a government which cares about protecting their image, even if it means wilfully distorting the research the public paid for. I'm not saying that cutting the funds to science is a good thing, or that scientists are wrong to go out and engage the public in the need for science funding. That is how you build democratic support for your position. But by conflating the funding and the muzzling, these latest protests and the media reporting them have watered down an important message about the way this government treats public research like the property of the Conservative Party. That's unacceptable, and it should have been the focus last week. I'm a physicist studying biology. I tell stories about the world because how else do we understand it?